Most herbs are perennial in my garden. We get frost and a little snow, but I've been lucky to have the majority of them last from year to year. To contain herbs and keep them from spreading throughout my limited garden space, I plant them in plastic pots in the ground. 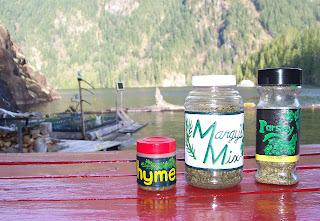 I also grow herbs in containers on the cabin deck. 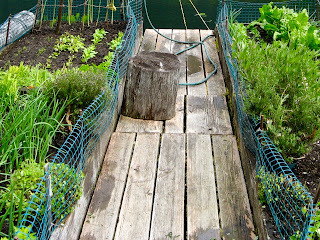 Herbs in pots along the edge of the float garden beds. I start most of my herbs from seed including basil, thyme, parsley, sage, dill and cilantro. I purchased starts for rosemary and mint that are now well established. 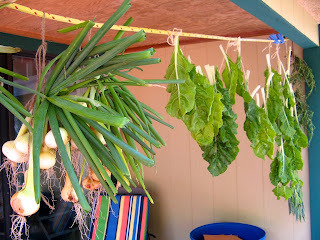 Herbs, chard and onions hanging to dry. I pick fresh herbs from spring to fall. Even in winter I can pick some, but it’s handy to have dried herbs in the kitchen. When I trim herbs back, I save the best for drying. Here’s my simplified method. 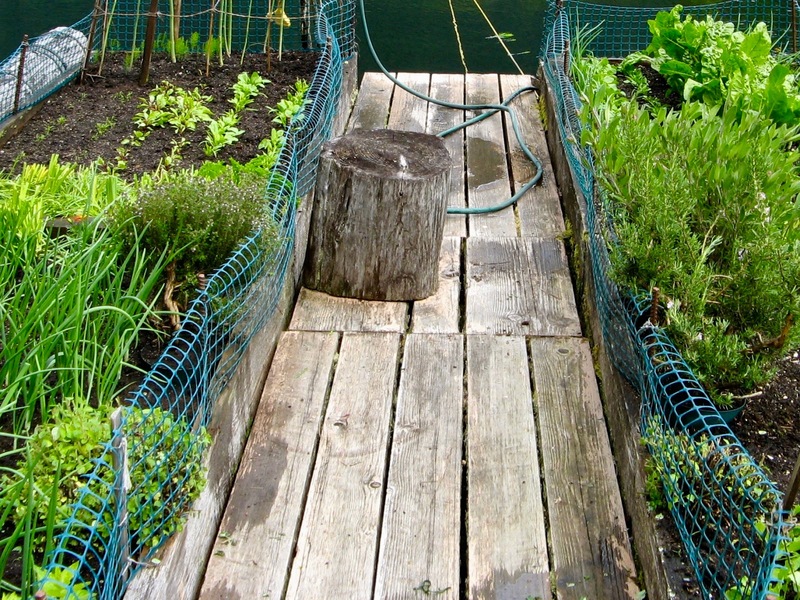 Cut and keep herbs that have little or no evidence of damage. Wash the cuttings in fresh water. Hang upside down or place small cuttings on cookie sheets to dry. Once dry, remove leaves from the stems and spread them in a thin layer on cookie sheets. Place the cookie sheets in a warm dry room away from sunlight. Stir the leaves daily until thoroughly dry. Depending on the size of the dried leaves, either package whole or cut them into smaller pieces. Store dried herbs in airtight glass or plastic containers. I like to combine my craft painting with dried herb storage. I save small jars and empty spice containers. I paint labels to match the dried herbs I have to store. Sometimes a batch of herbs isn’t large enough to store as a single item. When that happens, it becomes a part of Margy’s Mix. I use my special blend in soups and stews as a flavourful seasoning. For more preserving tips click here. 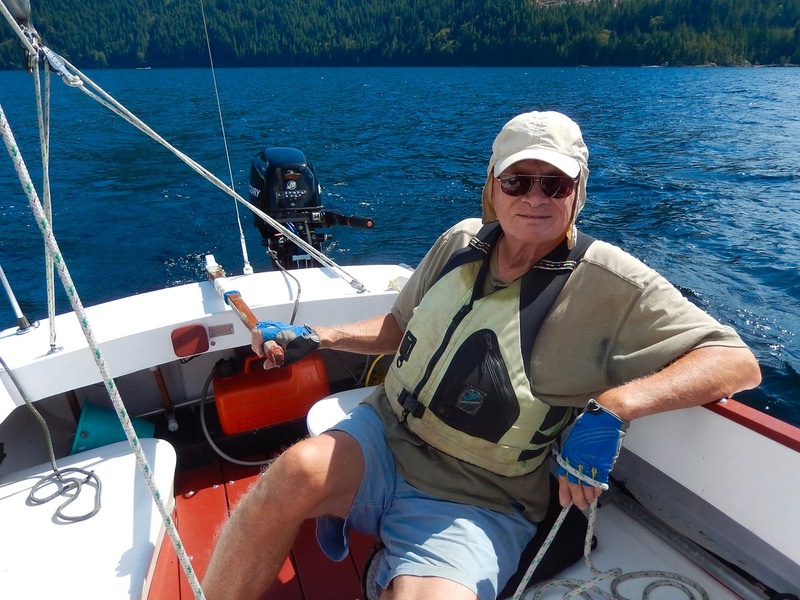 Blue summer skies and light winds are perfect for Wayne and I to go out in our 19' O'Day Mariner. We are teaching ourselves to sail, carefully. 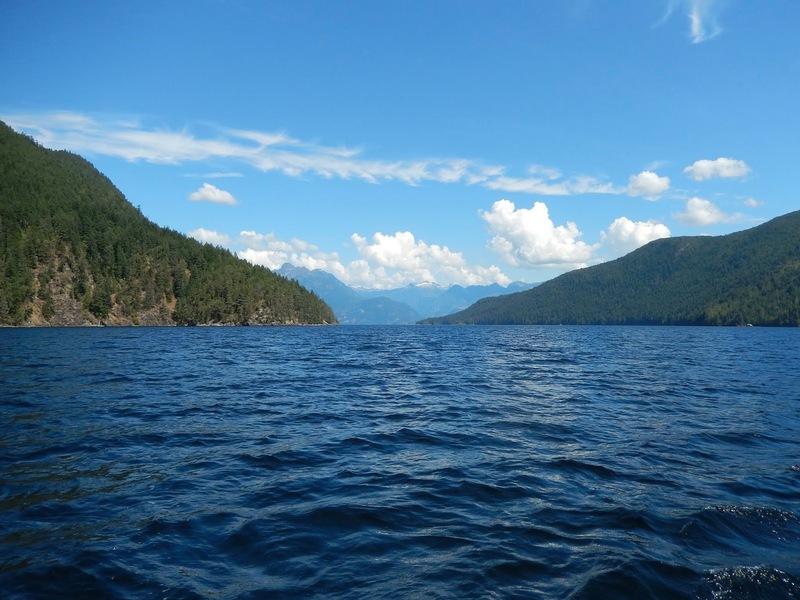 Large open areas on Powell Lake make that possible. On this day we practiced tacking into the wind to cross the area we call the North Sea. You wouldn't want to be out there in a little boat in a big storm. 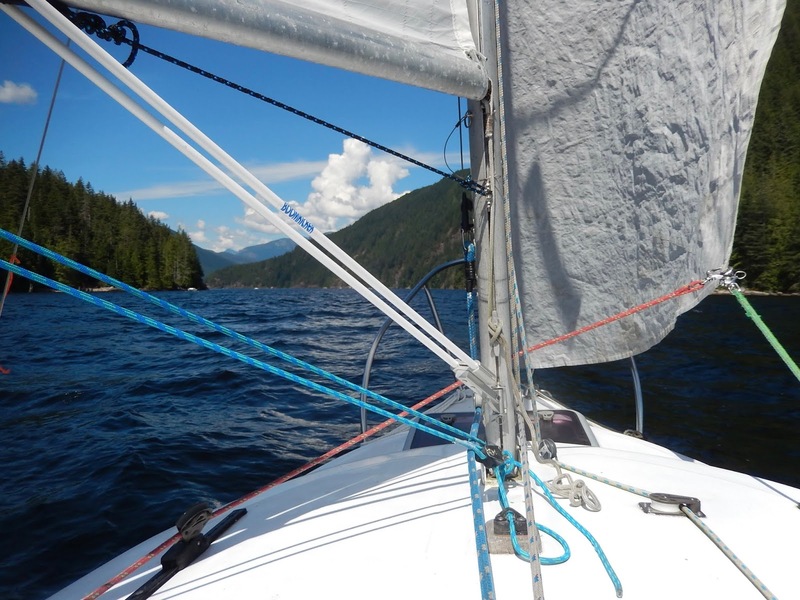 Sailing downwind back through First Narrows we got to practice a little "wing on wing" with the jib and main sail on opposite sides. Are you a sailor? How did you learn? 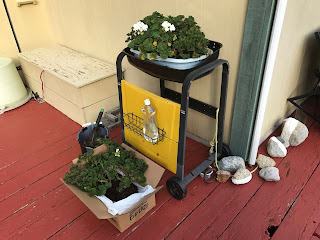 For the last few years I've tried different methods to save geraniums over winter. 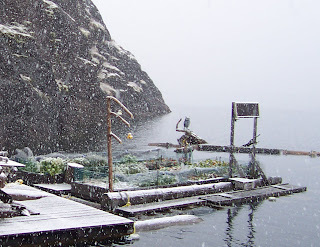 In a warm climate they can thrive year-round, but at my float cabin in Coastal BC it's a different story. I buy geranium plants at the nursery in May and enjoy them all summer in my repurposed BBQ planters. But when frost comes in November they die. What could I do to save them and money at the same time? Follow the links to read the full stories. Covering roots with newspaper and soil. My first try to save was covering the roots with newspaper and soil. It was a moderate success, but I had to buy lots of replacements. Experimenting with a plastic cover. My next tries included adding plastic covers. On my first try I uprooted the geraniums and placed them in a large pot with a plastic cover. White flies enjoying the warm environment were a problem. The next year I left the geraniums in their planter and covered it with plastic. Both tries were again a moderate success, but not perfect. Bareroot geraniums in the guest bathtub. Not one to give up, I tried a bareroot method the next winter. The dormant plants were stored in paper bags in town. They revived nicely, but I put them out too early and they didn't adapt well to alternating warm days and cool nights. Back to the nursery to buy more to fill in the gaps. Last winter I found a better method. I carefully removed each plant from the planter roots, soil and all. I trimmed the dead leaves and cut back long stems. Removing geraniums from their planter. I put the plants in a plastic tub and took them to town. I placed them next to a west facing glass door to get sunlight and watered them periodically from November through April. I waited longer to put them back out to avoid cold nights. 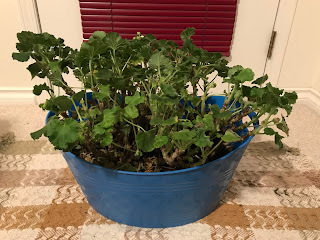 Storing the geraniums indoors for the winter. 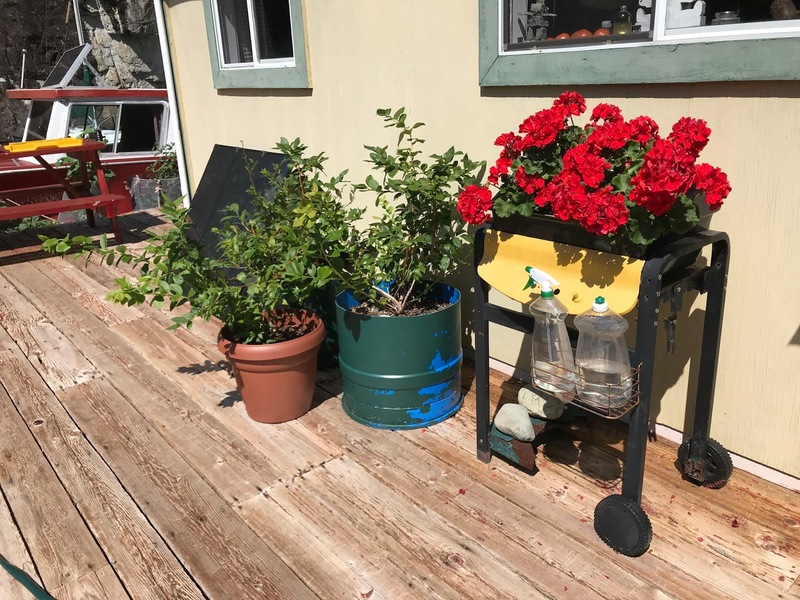 Here's half of my overwintered geraniums in the repurposed BBQ planter. The blossoms have been amazing on the more mature plants. 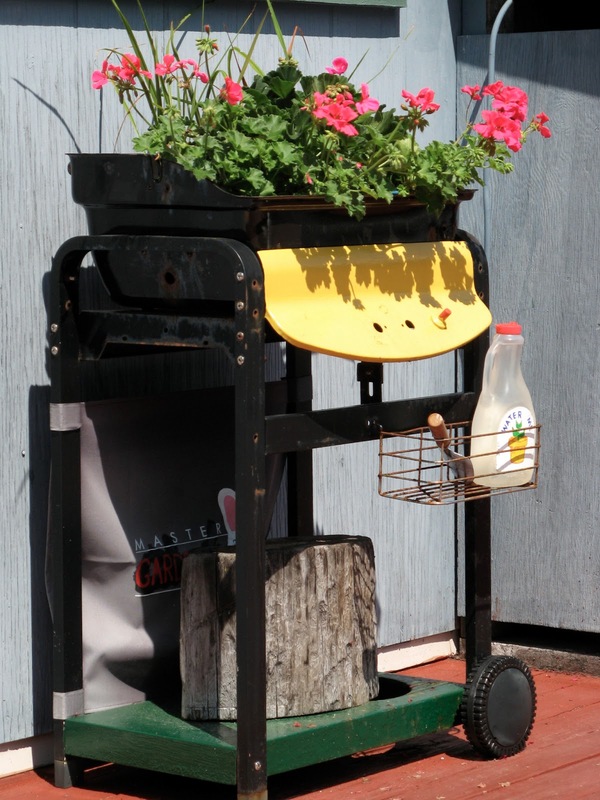 Overwintered geraniums in a repurposed BBQ planter. This year I've found a new type of critter in my floating garden. First I found two when I pulled out overgrown lettuce plants. 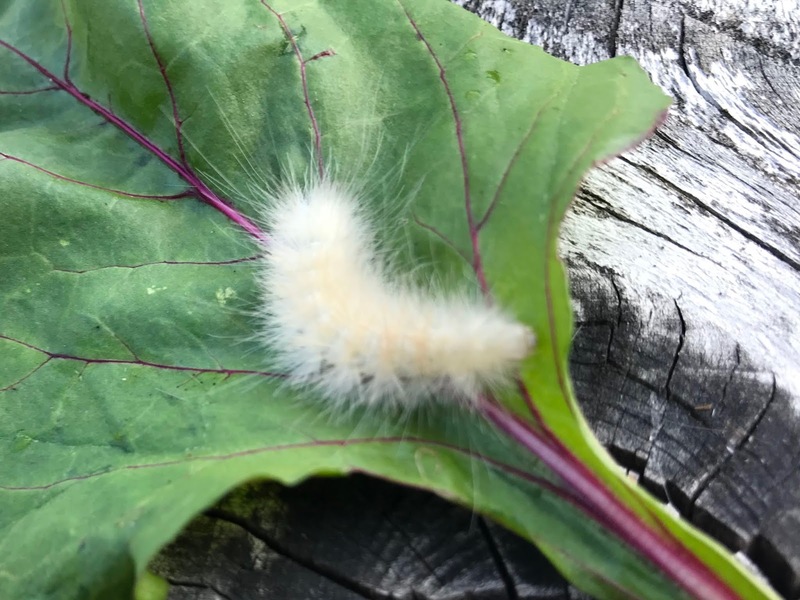 The next I found on beet leaves used as mulch under my broccoli, so I'm not sure which plant was the attraction. 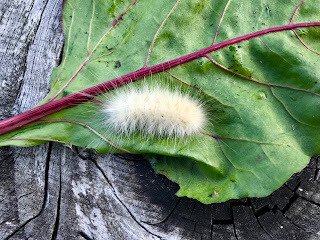 I'm pretty sure it is a caterpillar of the Virginian Tiger Moth (Spilosoma virginica), a white moth with small black spots on its wings. Yellow Woolly Bear caterpillar on a beet leaf. 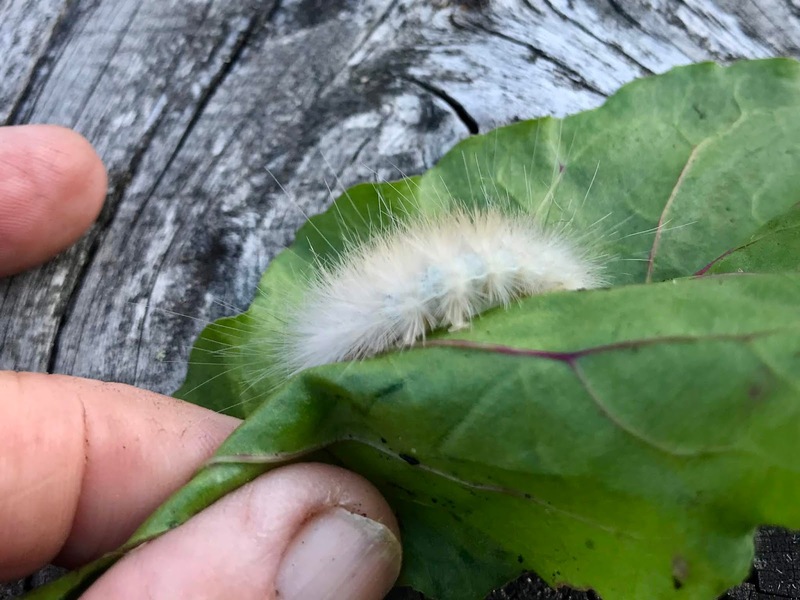 The larval stage is known as known as the Yellow Woolly Bear or Yellow Bear caterpillar. Even though the name implies they are yellow, actual colouring can be from white, to beige, to yellow and even dark red and brown. No matter what the colour, the woolly bear name comes from long its covering of long hairs. Virginian Tiger Moths and their Yellow Woolly Bear caterpillars are common throughout North America. 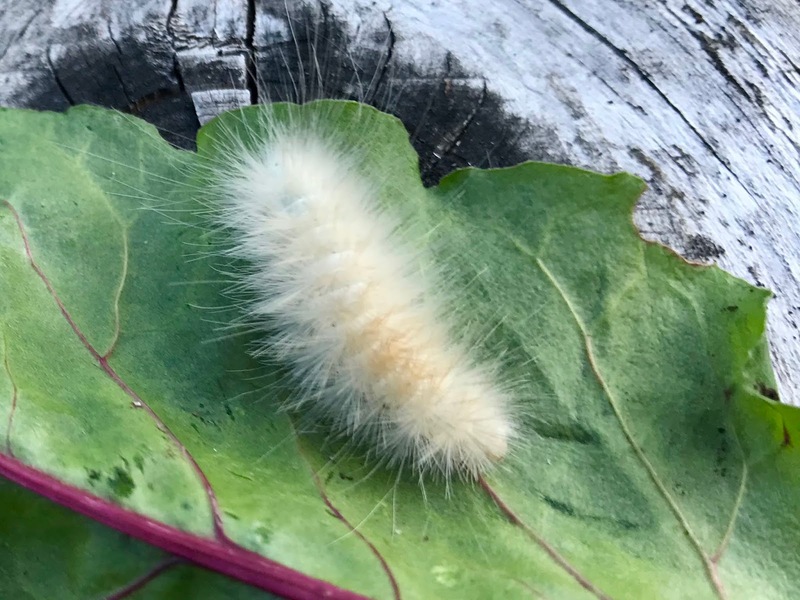 Caterpillars are abundant and feed on low growing plants, shrubs and even tree leaves in yards, gardens and natural settings. 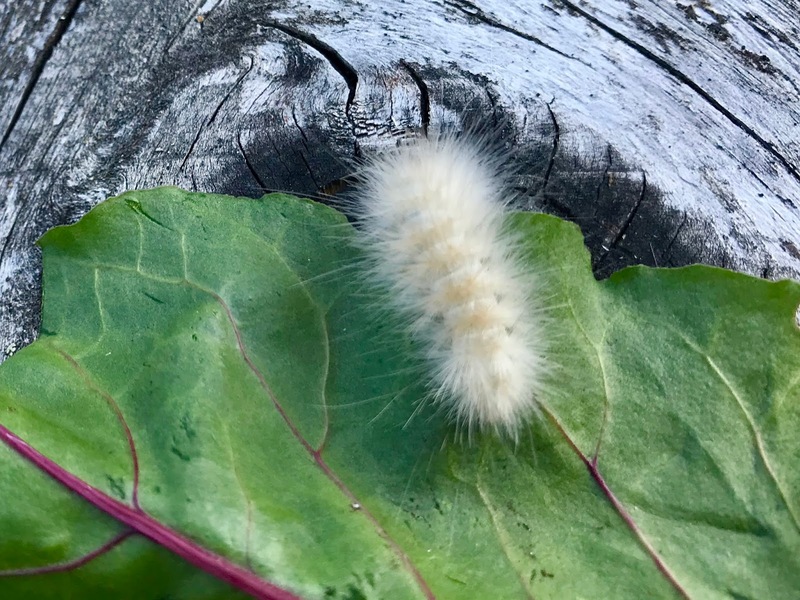 The caterpillars are voracious eaters. After about a month of eating their fill, they search for a place to pupate. Then, in about another month, they emerge as an adult moth. 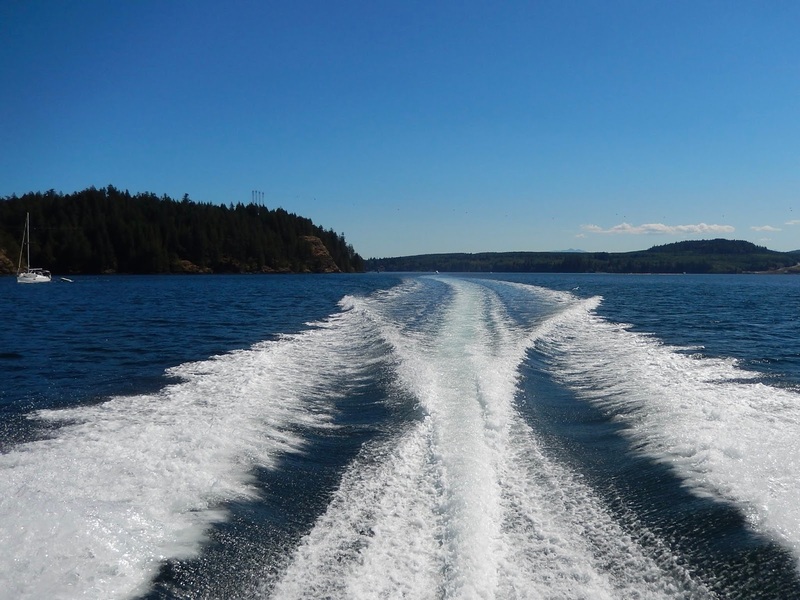 Another week of warm weather, blue skies and calm seas drew up back out in our Bayliner. 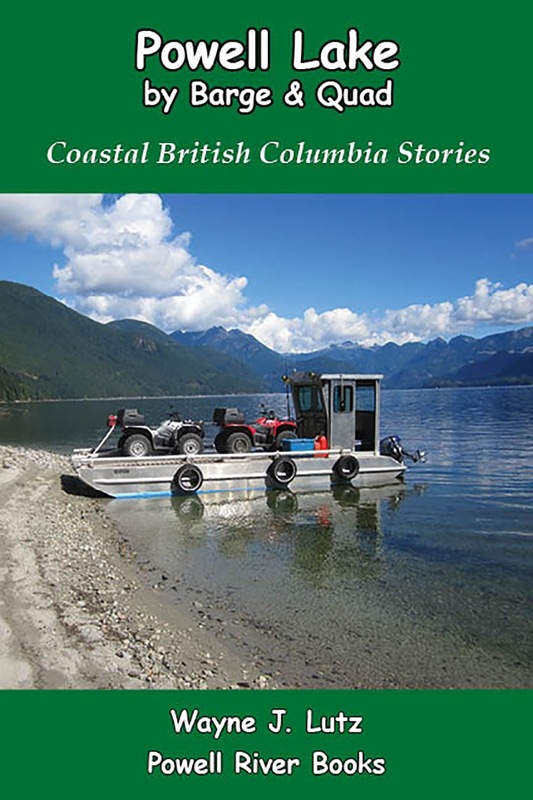 Here in Coastal BC we call it going out on the chuck, or salt chuck. Chuck is a Nootka First Nation word for water. Add the English word salt and you get a term for the ocean. To reach our destination we had to plan carefully to get through Seymour Narrows, a constriction between Johnstone Strait and Discovery Passage on the east side of Vancouver Island. 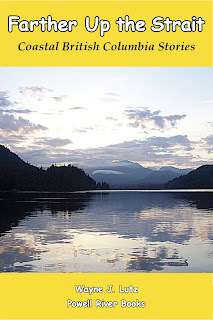 Seymour Narrows is affected by tidal currents up to 15 knots. This creates a dangerous condition except at slack water when the tidal direction reverses. Large cruise ships and tugs towing large loads time their passage along with smaller power and sailing boats. The narrows is 5 kilometres long and 750 meters wide. During slack it's like a congested freeway that doesn't seem so roomy when shared with a large log boom or a massive cruise ship. A unique breakwater of tanker cars and huge tires. 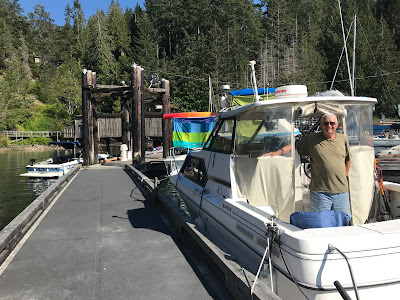 After dinner at April Point Resort and an evening at the nearby Campbell River Discovery Harbour Marina we set out early in the morning to catch the low water slack tide. 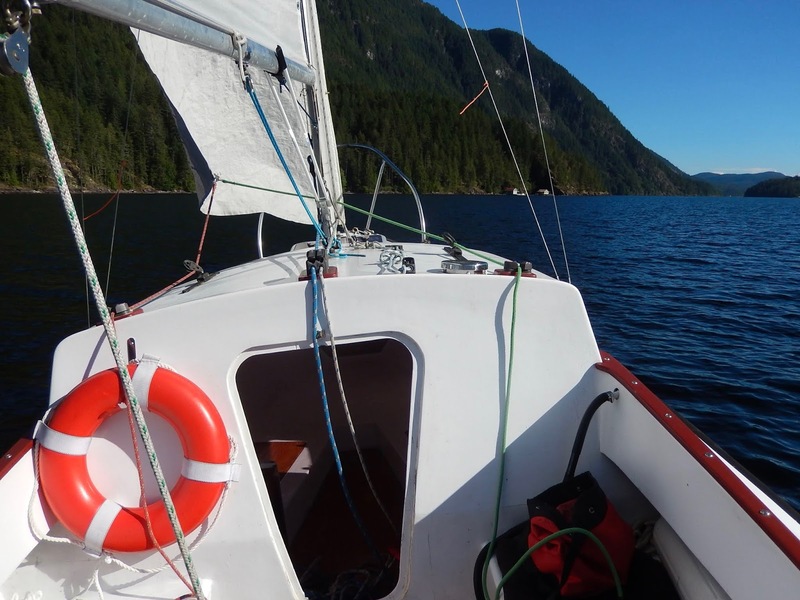 With no wind, it was an easy passage to our destination for the night, Browns Bay Resort. The marina at Browns Bay Resort. 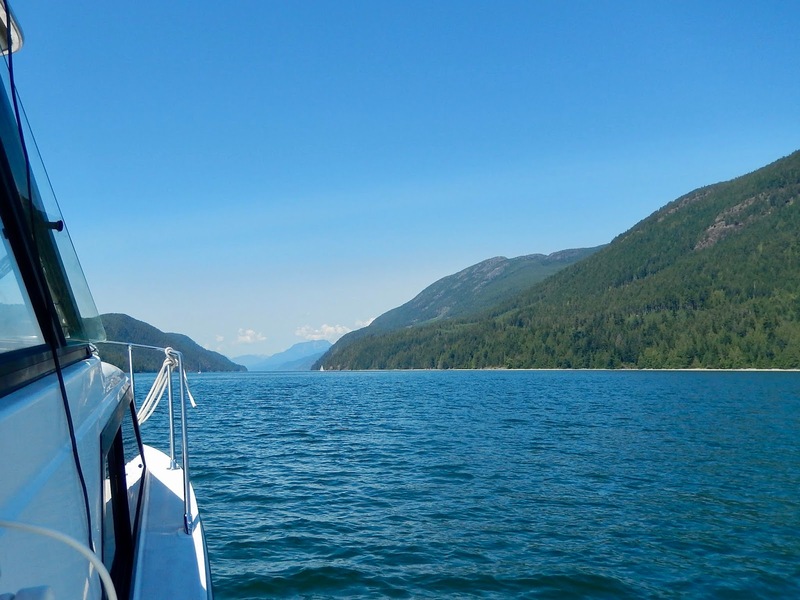 We chose this destination because Johnstone Strait is well known for salmon fishing. 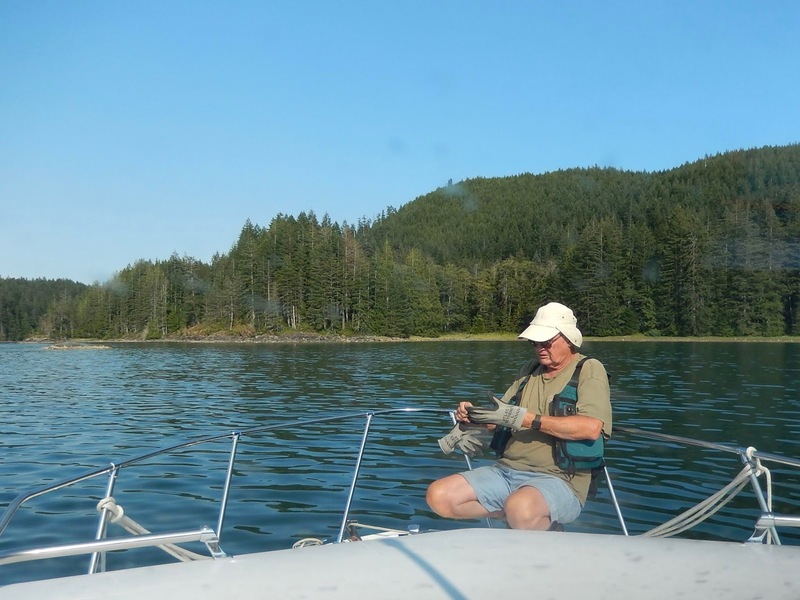 Just north of the resort is a popular spot for trolling and jigging for salmon. 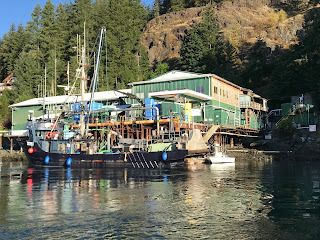 After checking in and finding our slip we headed to the Floathouse Restaurant for dinner. Fresh steamed clams, mussels and prawns along with a crisp Caesar salad were a perfect choice. The floating restaurant at Browns Bay Resort. With full tummies we headed to the fishing grounds. You can't always be lucky, but we did catch great views of cruise ships heading for Vancouver at high water slack through Seymour Narrows. 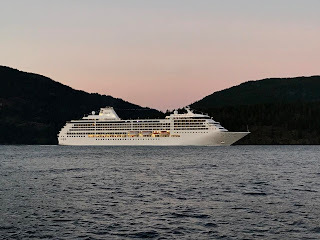 A passing cruise ship heading for Vancouver. Late at night we watched a large fish vessel dock up at the Browns Bay Packing plant. The next morning it offloaded its catch. Salmon is big business in this area, both recreational and commercial. A fish boat at Browns Bay Packing. We got up early to fish once again. Again, no luck. But any day fishing is better than any day doing anything else. It was only thirty minutes after the tidal turn so we headed back south through Seymour Narrows. I'm sure we'll be back to fish again, and a great meal at the Floathouse. At our slip in the Browns Bay Resort marina. 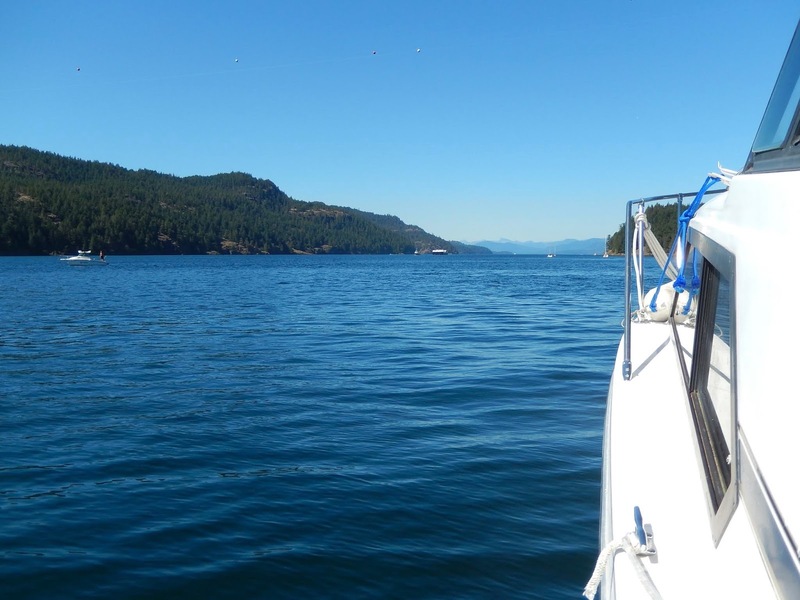 Boating on the Strait of Georgia, British Columbia, and the islands to the north. 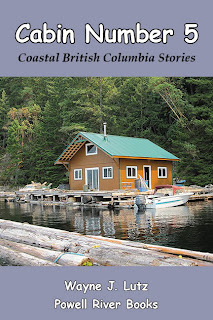 Stories of the people and places of coastal British Columbia, where the mountains drop into the sea and lifestyles focus on self-reliance and a different sense of purpose. 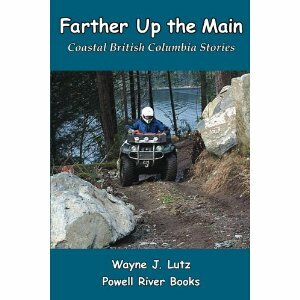 This book, based on the original Up the Strait, has more great boating stories and adventures. 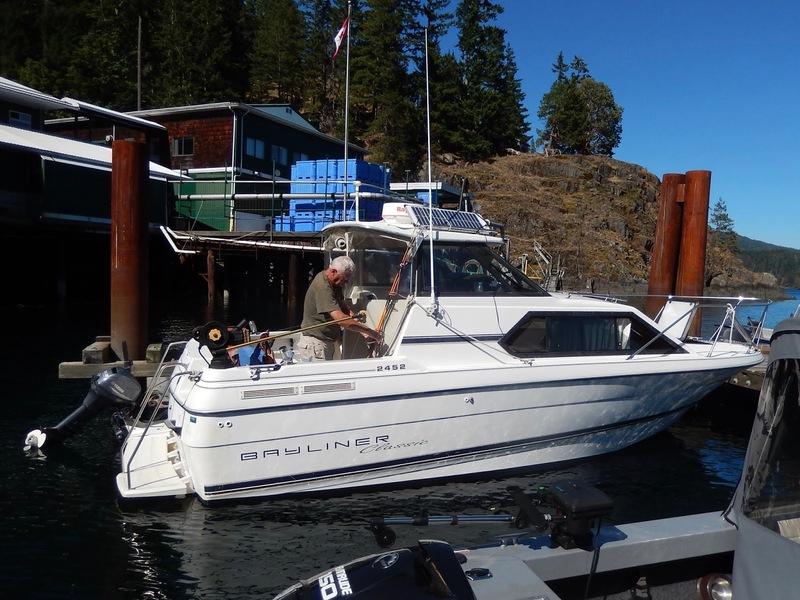 We treated ourselves to a four day upcoast cruise in our Bayliner 2452. From Powell River we headed up the Strait of Georgia to Refuge Cove on West Redonda Island. We've been here many times for fuel but I've always wanted to spend the night at this active marina. 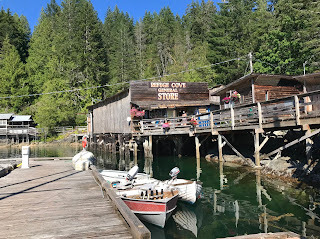 Historic Refuge Cove general store. 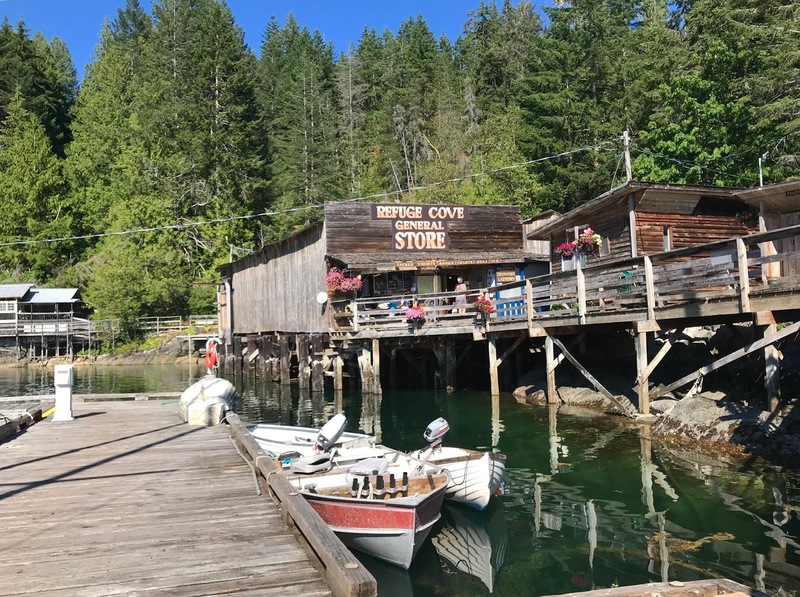 Refuge Cove has a long history of providing products and services to loggers and residents of remote Coastal BC. 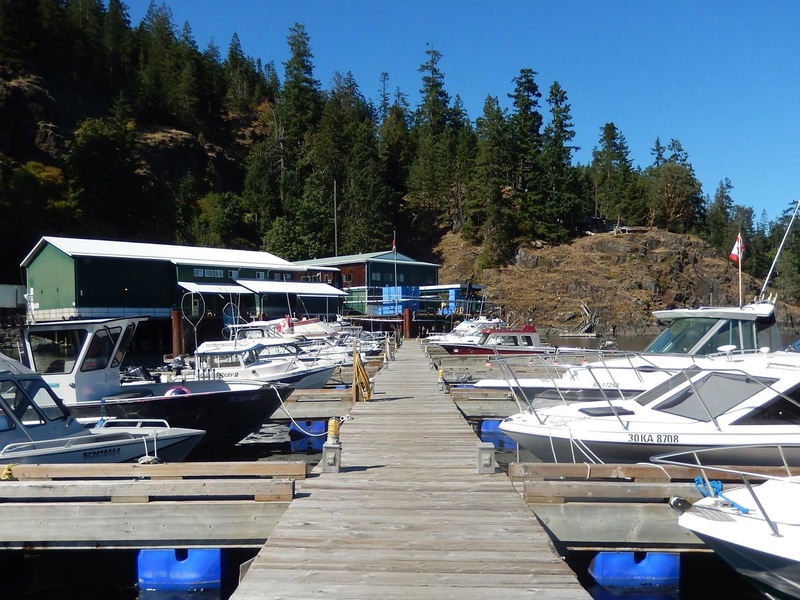 In summer, the most frequent customers are boaters arriving in everything from small runabouts to huge yachts. Overnight moorage is first-come, first-serve at a dollar a foot. 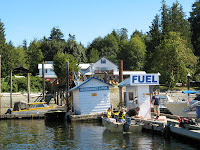 The fuel dock has gas, diesel and propane. The general store has everything from fresh vegetables to hardware. Other services include a post office, used books, showers, laundromat, garbage service and Internet. We saved our onboard food and had pizza at the Upcoast Summers restaurant. Docked for overnight at Refuge Cove. The next morning we waited at the dock for slack tide. We headed up Lewis Channel then angled into Calm Channel. So far all of the waterways have been wide and deep without major tidal influence. That was about to change. Our destination required us to pass through the Yacultas Rapids, Gillard Passage and the Dent Rapids all in one go. For a landlubber like me, it was a surprise when I learned that the ocean can create whitewater rapids to rival many rivers. But when the tide changes, the waters calm allowing boats to pass. You just have to know when (thanks to the tide tables) and be quick about it. Slack water doesn’t last long before the tide turns and starts running in the opposite direction. Blind Channel Resort fuel dock. We made it through all three rapids in calm conditions then got back up on plane to travel through Cordero Channel to Mayne Passage along the north side of East Thurlow Island to Blind Channel Resort on West Thurlow Island. 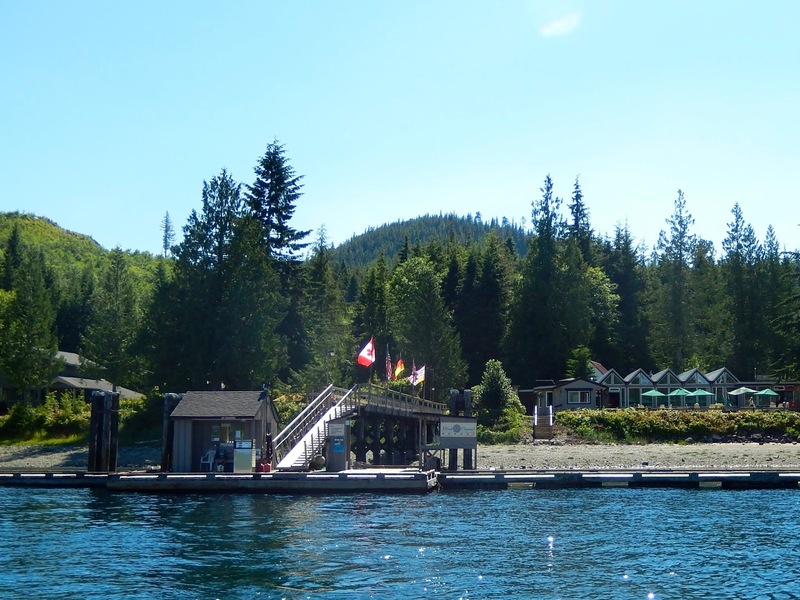 The resort has fuel, a store and restaurant. 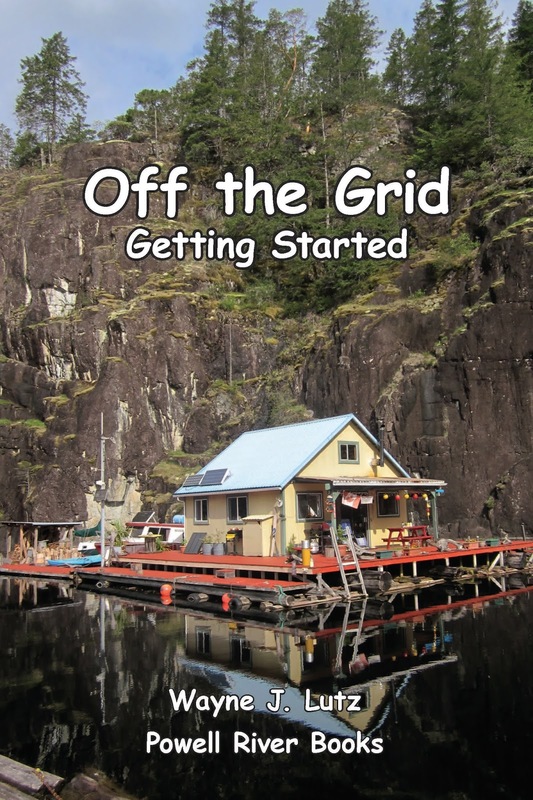 The docks were packed and they had no record of our reservation so we got gas and headed out to Johnstone Strait. Johnstone Strait on a good day. Johnstone Strait can get some pretty nasty winds, waves and tidal action all mixed into one. Fortunately today, the wind was light. We chose to return to an anchorage we used several years ago on the northwest side of Quadra Island. Small Inlet has a tight entrance with floating bull kelp, but inside it has protection from wind and good hold for anchors. Wayne dropped ours and we had a private spot for the night with only one other boat a long distance away. 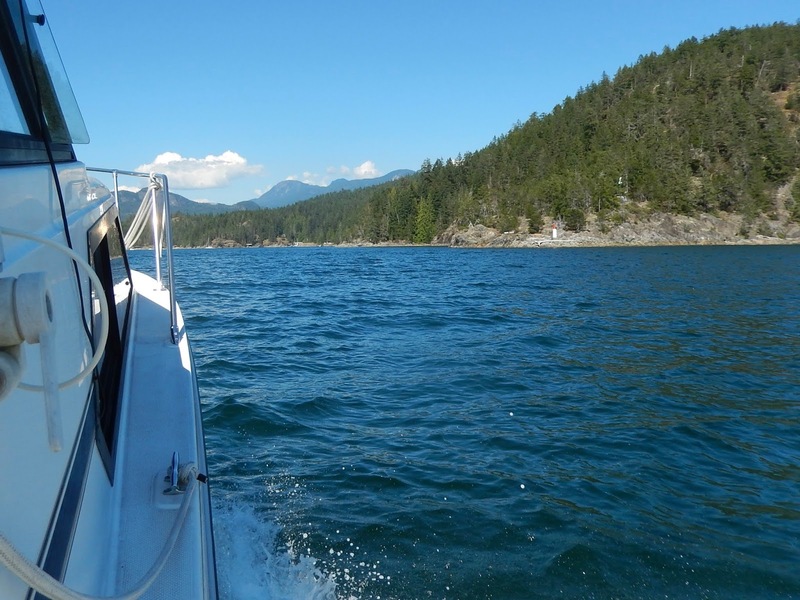 Dropping anchor in Small Inlet or Quadra Island. We enjoyed a simple cold chicken dinner. Some people enjoy preparing fancy meals on board. With our small galley it's much easier to bring prepared foods. Plus, we enjoy it that way. The next morning we again waited for slack tide. We had three sets of rapids to cross to get over the top of Quadra Island. 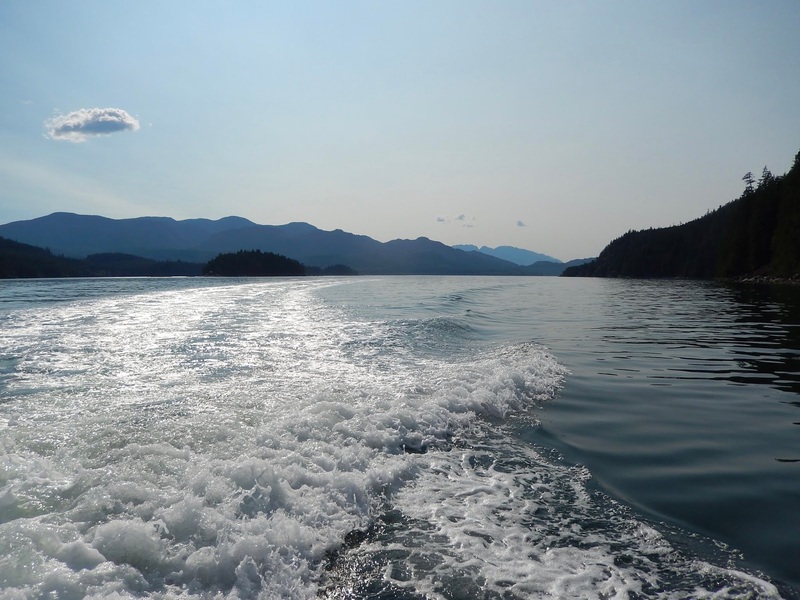 The Lower and Upper Okisollo Rapids followed by the strongest one in Beazley Passage (aptly named Surge Narrows) between Quadra and Maurelle Islands. Motoring slowly through Beazley Passage. The flow can get up to 12 knots and pretty rough. You can hear them roar just like a waterfall. Beasley is beautiful as you pass through it’s narrow walls. 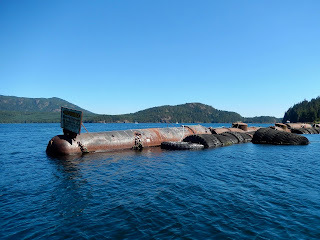 Then you are back in the open and deep waters of Hoskyn Channel. Looking back north I could see my favourite feature, Cowboy Hat Mountain. Cowboy Hat Mountain on the left. It's real name is Mount Doogie Dowler. Don't you thing The Cowboy Hat sounds more appropriate? To cap off our trip we stopped at the Heriot Bay Resort marina. 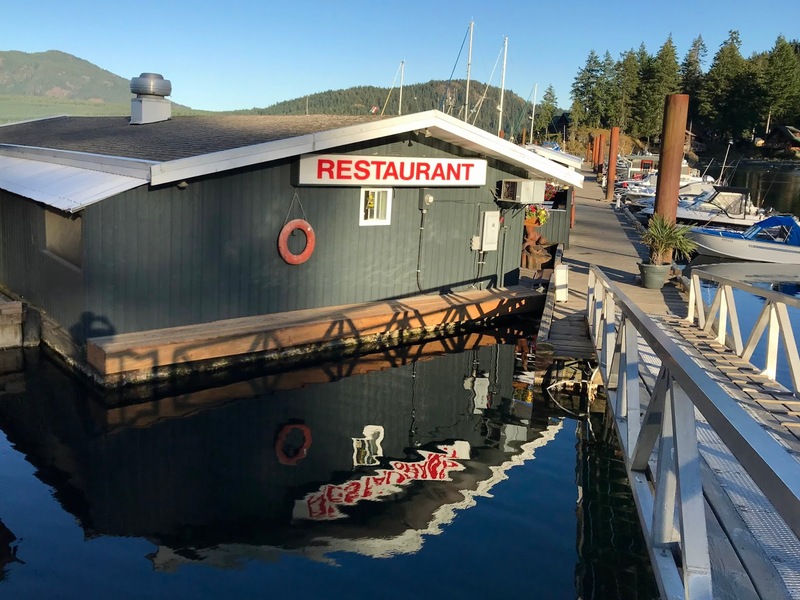 When we are out in the boat it's hard not to go there for a great meal, a trip to the Heriot Bay Store to get a fresh baked pie for dessert and a quiet night at the dock. I hope you enjoyed your cruise with us in Coastal BC.